Jet fuel is extracted from the middle distillates fraction and competes with the production of diesel. Aviation fuel is almost exclusively extracted from the kerosene fraction of crude oil. Today global oil production is roughly 81.5 million barrels per day (Mb/d), which is equivalent to an annual output of 3905.9 Mt. Aviation fuels include both jet fuel for turbine engines and aviation gasoline for piston engines. The dominant fuel is jet fuel originating from crude oil as it is used in all large aircraft. Jet fuel is almost exclusively extracted from the kerosene fraction of crude oil, which distills between the gasoline fraction and the diesel fraction. The IEA estimated the world’s total refinery production in 2006 was 3861 million tonnes (Mt). The aviation fuel part was 6.3%, implying an annual aviation fuel production of 243 Mt (corresponding to about 5 Mb/d), including both jet fuel and aviation gasoline. Figure 3 shows how the world’s refinery production is divided into different fractions. If the refinery would like to increase jet fuel production, diesel production must decrease. During the year the proportion between diesel and jet fuel production changes and the fuel most profitable at that moment is produced. Swedish Environmental class-1, ultra-low sulphur, diesel is a prioritized product, which has the consequence that no jet fuel at all is manufactured. The kerosene fraction is blended directly into the diesel fraction to provide the correct viscosity properties. Having fewer products is a way to increase the efficiency of the refinery. The conclusion to be drawn is that aviation fuel production is not a fixed percentage of refinery output. 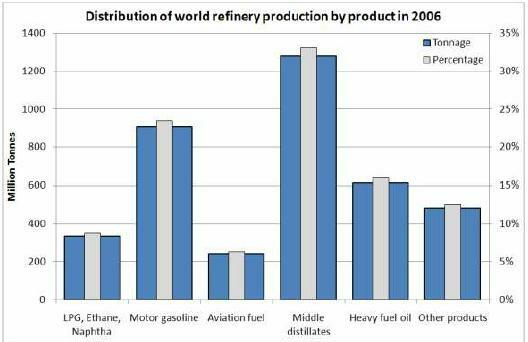 In 2006, aviation fuel was 6.3% of world refinery production. The kerosene fraction is an average of 8-10% of the crude oil, but all kerosene does not become jet fuel or diesel. Kerosene can also be used to decrease the viscosity of the heavy fractions of crude oil and is used as lamp oil in certain parts of the world. The environmental parameters that define the operating envelope for aviation fuels such as pressure, temperature and humidity vary dramatically both geographically and with altitude. Consequently, aviation fuel specifications have developed primarily on the basis of simulated performance tests rather than defined compositional requirements. Given the dependence on a single source of fuel on an aircraft and the flight safety implications, aviation fuels are subject to stringent testing and quality assurance procedures. The fuel is tested in a number of certified ways to be sure of obtaining the right properties following a specification of the international standards from, for example, IATA guidance material, ASTM specifications and UK defense standards (Air BP, 2000). Tests are done several times before the fuel is finally used in an airplane. Today, the increasing addition of biofuels to diesel is a problem for the aviation industry. One of the more common biodiesels is FAME (Fatty Acid Methyl Esther). FAME is not a hydrocarbon and no non-hydrocarbons are allowed in jet fuel, except for approved additives as defined in the various international specifications such as DEF STAN 91-91 and ASTM D 1655. Consequently, biofuels-contaminated jet fuel cannot be utilized due to jet fuel standards. The problem with FAME is that it has the ability to be absorbed by metal surfaces. Diesel and jet fuel are often transported in a joint transport system making it possible for FAME stuck in tanks, pipelines and pumps to desorb to the jet fuel. The limit for contamination of jet fuel with FAME is 5 ppm. FAME can be picked up in any point of the supply chain, making 5 ppm a difficult limit and therefore the introduction of biofuels to the diesel fraction has had a negative impact upon jet fuel supply security. This entry was posted in Airplanes, Transportation. Bookmark the permalink.